Sandy swim beach at Lily Bay State Park on Moosehead Lake. Photo courtesy of Erik Stumpfel. Peaks-Kenny State Park is located on Sebec Lake, near the town Dover-Foxcroft. A mile-long stretch of sandy beach is open to the public. A lifeguard staffs the area during the summer, allowing you to swim in the lake with views of beautiful Borestone Mountain. The park has 56 campsites as well as facilities with flush toilets and hot showers. There is a two-night minimum stay for reserved campsites and a two week maximum stay during the peak tourist season of July and August. Peaks-Kenny State Park is open from May through September; entrance fees are $4 for residents and $6 for non-residents; call 207-564-2003 for more information. Lily Bay State Park, located near Greenville, was founded after Scott Paper Company donated the land to the state. 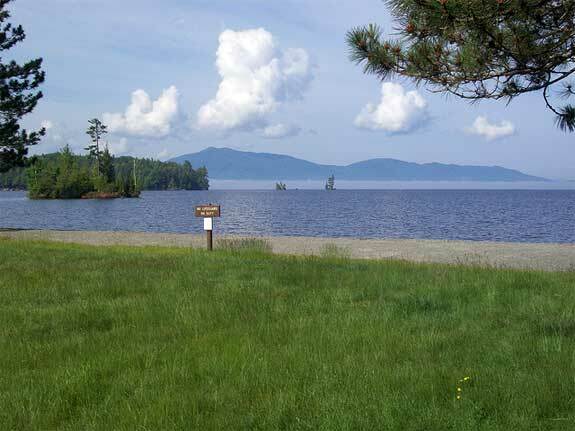 The park is on the shores of Moosehead Lake, the largest lake in New England. Lily Bay State Park features a sandy swimming beach with nearby picnic areas. The park also offers two campgrounds on the shore of the lake with 90 campsites. Pets are permitted in the park if they are kept on leashes and never left unattended. Lily Bay State Park is open from May 1 to Columbus Day; entrance fees are $3 for residents and $4.50 for non-residents. Call 207-695-2700 for more information.